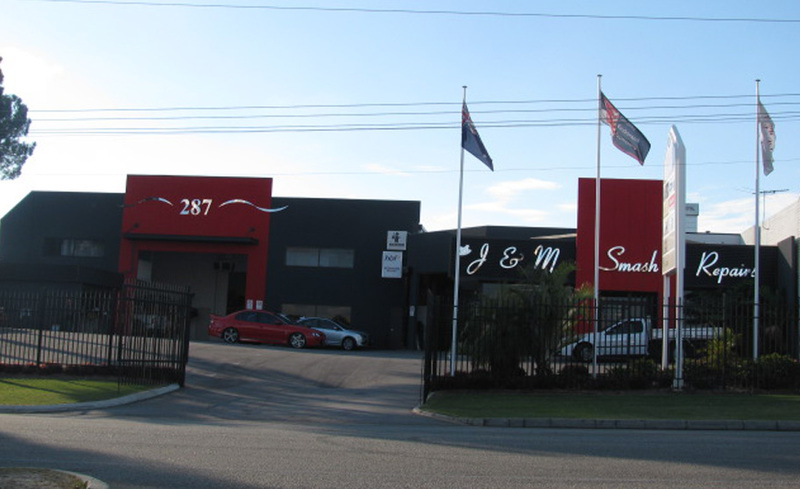 J & M Smash Repairs is a trusted, locally-owned automotive repair business based in Perth, Western Australia. With Motor Trade Association approval and more than three decades of industry experience, there's no better place in Perth for body repairs, spray painting and panel beating. We specialise in insurance work. Panel Beating. The most critical stage of car repairs is the body alignment. Using the latest technology, we get the job done. The jigging system offers the exact chassis alignment, similar to the way vehicles are manufactured. To ensure perfection, the "Shark" computerized measuring system is 100% accurate and will give a print out of the chassis and body dimensions, both before and after repairs. We also use the latest pulling equipment - the Korek 4000 chief bench- which is designed to be used for light and heavy vehicle repairs. Spray Painting. To start this process, all colours are matched by highly-skilled technicians on our computerized mixing system. Only the highest-quality baked enamel is used to ensure the manufacturers match. Listen to what the Panel & Paint Judges had to say.The judging team has never been to J&M Smash Repairs and we've been seriously missing out, because this is a great shop. OWNED BY BROTHERS Jim an Mario Zito, the buisness was set up in 1988. The team undertook an extensive renovation back in 2010. The street facade is eye-catching - the red, black and silver combo really works. The exterior and large stunning reception is an example of innate Italian styling -It's a modern take on Art Deco. Out of the kitchen comes a truly delicious coffee and the best biscotti I've tasted. This is a substantial shop - 1500m2 - that's superbly organised. It's clean, well laid out and the staff all seemed happy to be there. We spoke to a painter who had joined the company a few months earlier and he couldn't have sung J&M's praises higher in terms of what a great place it is to work and the shop's dedication to putting out top quality work. The fact that there are so many long term employees speaks volumes. Flexible working hours and regular staff events no doubt contribute to team loyalty. J&M specialises in medium to big hits — which is pretty smart in the Perth market where there are a number of MSOs specialising in small hits. The shop has its own well equipped plastic repair room (Jim describes the inhabitant as an artist) and everything around the whole site is signposted to make it quick and easy to find. The paint shop sports five spacious prep bays and there are two oversized Saico ovens that you could probably fit two small cars in - and a shedload of parts. The paint and panel team are both working with top quality equipment, lighting is also good. 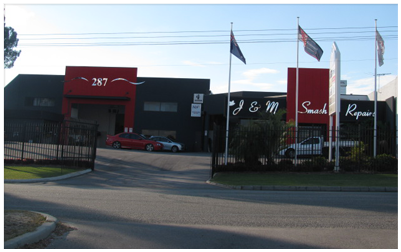 J&M is another example of an established business that keeps up With the latest techniques. Parts are pre-ordered and the team has devised an excellent visual system to ensure there are no mistakes. They don't start working on the car until everything is in. The team undertakes I-CAR and Valspar training to keep their skills up to date. All headlights are properly calibrated before the vehicle leaves the shop and there are a number Of quality checks before the vehicle is handed over to the customer. The company is proud to have been complying is ISO 9001 for Over 15 years. Jim and Mario also market the business well through Facebook, radio and online advertising as well as producing brochures about the business. The brothers clearly take their reputation for both customer service and quality repairs incredibly seriously and combine passion, precision with Italian flair. Contact us today to discuss your smash repair requirements.